This review first appeared in the June 28, 1997 edition of the American Reporter. 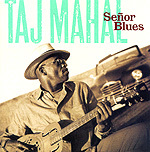 Thirty years now Taj Mahal's been playing some of the best contemporary traditional music on the scene. And, no, that was not an oxymoron just there  he plays traditional American music with a contemporary bite and sound. Damn few manage to pull that off  Leon Redbone and Dr. John come to mind immediately; anyone beyond that requires more thought. On his newest album, Mahal (whose real name is Henry Sainte Claire Fredericks) returns to his own roots  stripped down, mostly acoustic folk music from across the musical spectrum. As on his first few albums in the late '60s, he's all over the map: Hank Williams' "Mind Your Own Business," Washboard Sam's "Sophisticated Man," the Steve Cropper/Otis Redding classic "Mr. Pitiful," avant-garde jazzist Horace Silver's title track (and really, who besides Mahal would have the ability to pack Silver and Washboard Sam back to back and make it work?). As always, Mahal's distinctive, gruff vocals anchor the outing, underpinned by his wonderful guitar picking, often on a National Steel. He's backed by a tight little band, and a really top-flight horn section (Darrell Leonard and Joe Sublett). And, as always, the whole thing swings like crazy with a joyful exuberance that has always marked Mahal's playing. Don't believe me? Then check out his crazy kazoo solo on "Sophisticated Mama"  if you aren't dancing all over the living room, better open that respirator a tad more and get some oxygen in your system. That's really the way in which Mahal blends old and new  he takes traditional songs and makes them sound as modern and accessible as the latest Top 40 pabulum. 'Course, this stuff will stick in your head a lot longer than the latest Mariah Carey hit.